While one-off teeth whitening treatments can get great results, staining is constantly occurring and results can fade quickly. Teeth whitening pens are a great tool to help maintain a whiter smile. But with such a range of products available on the market, many are ineffective and some even dangerous, so it can be difficult to know which product is right for you. One whitening pen might sound great, but how does it compare to others available? Is it safe? And is it worth the cost? Find out in our round-up of the Best Teeth Whitening Pens. 1. How do whitening pens work? 2. Are whitening pens safe? How do teeth whitening pens compare to other whitening products? Whitening pens work in the same way as many bleaching products. They use a bleach which seeps into the tooth and breaks up color compounds, making the teeth appear white. This means that the most effective whitening pens not only remove surface stains, but can whiten the tooth beyond its natural color. The bleach used in most whitening pens is hydrogen peroxide. This is the same enamel-safe bleaching agent as used by dentist across the world. Many studies have shown that, with proper use, hydrogen peroxide should not cause damage to the tooth’s enamel. While whitening pens are safe to use, you may still experience some discomfort. The most common side effect of teeth whitening is tooth sensitivity. This is typically worse for those with already-sensitive teeth, but is usually temporary and not harmful. As the gel can come into direct contact with your gums, the chances of experiencing gum irritation are heightened when using whitening pens. To combat this, many whitening pens use a lower concentration of peroxide to minimise the risk of irritation. However, the lower concentration of bleaching agent means that whitening pens are less effective at whitening than their stronger counterparts, such as whitening strips or gel kits. Wait the designated time before eating or drinking. Some whitening pens will require you to rinse after a certain amount of time, whereas other formulas will dissolve. Consult the manufacturer’s directions for best results. Dry your teeth with a tissue before applying. This ensures that the gel gets best contact with the teeth. The Colgate Whitening Pen comes in a kit with the Optic Whitening Toothbrush. Colgate recognises that any whitening product works best when consistently used and their solution is this convenient all-in-one brushing and whitening system. Simply store the whitening pen inside your toothbrush handle, ready to be used at the end of your oral hygiene routine. When used in tandem with the Whitening Toothbrush, the Colgate Whitening pen can lighten your teeth by up to 5 shades, with results visible from as soon as one day. For full results, continue to use twice daily for 3 weeks. The Colgate Whitening Pen kit is great for anyone looking to improve their overall oral hygiene and implement teeth whitening with ease. Auraglow is becoming a well known brand in teeth whitening, especially with their Auraglow Teeth Whitening Kit. However, if you’re looking for a teeth whitening regime that is a little less hands on, their whitening pen could be a good choice for you. Designed to compliment a busy and on-the-go lifestyle, the Auraglow Teeth Whitening Pen takes just 60 seconds per application. The 35% carbamide peroxide formula utilises renowned Auraglow technology and can whiten teeth by up to 8 shades. It is also gluten free and kosher friendly, as well as manufactured in the USA. 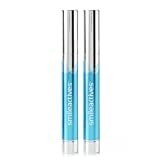 Sturdy and easy to use, this slim 5” whitening pen travels perfectly in a purse or pocket, making it an ideal whitening pen for those on the go. Philips is one of the most well-known electronics brands in the world, so it might surprise you that they also do whitening pens. However, these pens are part of their successful Sonicare oral hygiene line. The packaging of this product has changed several times over the last few years, but all feature the iconic ZOOM! logo and the expert whitening technology that goes with it. The Philips Zoom Whitening Pens are often recommended by dentists and can provide whitening of up to 5 shades lighter. They are an excellent option for anyone who wants to stick to name brands that they know and love. A perfect addition to your Sonicare routine! The Dazzling White Instant Whitening Pen is the least expensive whitening pen in our Best Teeth Whitening Pen round up. Despite the low cost, it can whiten your teeth up to 4 shades in just one week. Although it is powerful, the risk of gum irritation is minimal as the whitening pen comes with a petroleum jelly barrier to apply to the inside of your gums. This stops the whitening product from coming into contact with your gums and potentially irritating them. Despite not being a well-known brand, this USA made product product is a solid choice for the price-conscious shopper. For even better value for money, opt for a multipack. 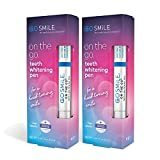 The Smilebriter Teeth Whitening Gel Pen is a favorite on Amazon. This could be due to the fact that the extra strength formula gets results while still being a consciously-made product that is gentle on your mouth. As Smilebriter Teeth Whitening Gel Pens are stronger than many other whitening pens, they give great results. However, for those with sensitive teeth and gums, this product could be too strong. Vegan and kosher whitening products are difficult to come by, and these whitening pens are perfect for anyone who needs these requirements. While not a well-known name, Dentapro have whitening products that work. Their Professional Teeth Whitening Pens contain 35% carbamide peroxide which is a medium strength concentration for whitening pens. While this whitening pen rarely causes sensitivity, results are limited. Surface stains should be removed, but deep whitening is unlikely. The biggest draw to this whitening pen is that it achieves results without the price tag of other well-known brands. 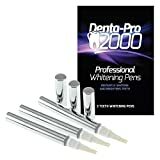 The pen can be prone to leaking, so while it is perfect for at home use, the Dentapro Whitening Pen is not suited for on-the-go whitening. The Smileactives Advanced Teeth Whitening Pen uses Polyclean Technology to ensure that the active ingredient gets into all cracks and crevices on the tooth surface. This helps it to achieve great whitening effects that are up to 6 shade whiter. In a clinical trial, 100% of patients reported whiter teeth after using for 7 days. Despite being effective, the whitening formula is free from alcohol, parabens, detergents and artificial colors that can often cause irritation. It also has a vanilla mint flavor that leaves your breath feeling fresh. Each whitening pen contains enough gel to last 3 weeks – enough for a full course of twice daily treatments. The pens are travel sized and beautifully designed, making for a premium whitening experience without the price tag. If you’ve looked at teeth whitening, you have probably heard of Go Smile. They are constantly pushing the boundaries of teeth whitening with products like their whitening toothbrush and their snap packs. Recipient of New Beauty’s Beauty Choice Award for 2016, the On The Go Whitening Pen requires just seconds of use per day. You don’t even have to wait for it to dry! Using Hyperox Technology, the whitening gel dissolves into the teeth, leaving behind a minty fresh aftertaste. Each stylishly designed tube contains enough gel for 7 days of applications. Whitening pens are an excellent tool for touch ups and maintaining a white smile. They are also great for people who are on the go and those with limited time. Each one has strengths and can be better suited to one person over another. However, if you’re looking for a significant and long lasting result, you may wish to opt for a one off whitening product first. The Colgate Whitening Pen comes in at a close second: it delivers results, is a good price and comes from a highly reputable brand. However, it is less suitable for electric toothbrush users as it is only available to purchase with the toothbrush. For best ethical product, opt for the Smilebriter Whitening Pen which is vegan and cruelty free. The Philips ZOOM! whitening pens get our vote for the best whitening pen. While all of the whitening pens in our round up are great products, the ZOOM! whitening pens are the most frequently recommended by dentists and have withstood the test of time.